The 3rd Earl of Sandwich. Edward Montagu, 3rd Earl of Sandwich (10 April 1670 – 20 October 1729) was born in Burlington House, London, England to Edward Montagu, 2nd Earl of Sandwich and Lady Ann Boyle. 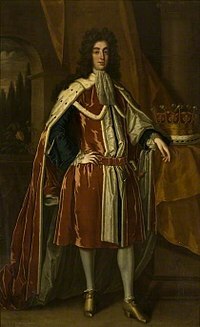 He was styled Viscount Hinchingbrooke from 1672 until his accession to the earldom in 1688. On 8 July 1689 he married Elizabeth Wilmot, daughter of John Wilmot, 2nd Earl of Rochester and Elizabeth Malet. They had two children, Elizabeth, who died as an infant, and Edward Richard Montagu, Viscount Hinchingbrooke (7 July 1692 – 3 October 1722), who predeceased his father. On the accession of Queen Anne, Sandwich was appointed Master of the Horse to her husband, Prince George of Denmark, despite strong objections from the royal favourite Sarah Churchill, who wanted the office for one of her own family. Sandwich was generally regarded by his contemporaries as insane: his wife so far as possible kept him "close confined" at Hinchingbrooke, and entrusted the management of the family estates to their son, as soon as he was old enough to take charge. From 1704 at the latest the Queen came under intense pressure to dismiss him; she followed her frequent policy of temporising, writing that she thought that "he was not as ill as he was said to be". In 1705 however Sandwich's mental illness became so obvious that he was obliged to resign his office, and lived for more than twenty years in retirement until his death in 1729. This page was last edited on 27 May 2017, at 20:25 (UTC).